A machine crew arrived to further grade the land around the house, remove large rocks and smooth the soil yet again. 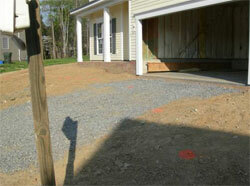 They also prepped for a pour of the driveway at a later date. The grading made a huge difference. I could definitely see a lot less injuries for kids playing a round the yard. Also cutting the lawn will be a much less strenuous task. Excavators 2, Mother Earth 0. Land grading is the process of leveling or smoothening a particular soil base in preparation for construction projects, landscaping, or road building. It is often applied to parcels of land with uneven or sloped terrains. Land grading is important for farming to avoid possible irrigation problems. Depending on the soil surface, land grading can be either a very simple or a complicated task. For the more basic and simpler grading jobs, a tractor may be more than enough. The tougher ones, however, may require a bulldozer or skid steer to make the grading process easier. It is therefore important to survey the area first, prior to grading. 1. Using a garden tractor will help with the grading of even land. First, attach a smooth front blade implement to it. The tractor will help smoothen out the surface by flattening any large mounds of soil. 2. To begin the land grading process, power up the tractor and lower the blade. Make sure that the blade is just slightly raised over the ground. Drive the tractor slowly in the beginning as you drag the blade over the soil. In some cases, the land would already be even at this point and you may stop grading as no additional procedures may be necessary. Proceed to the following steps if further grading is required. 3. If necessary, connect a box scraper to the backside of the tractor for a more precise grading. It is all right even if the scraper extends beyond the width of the tractor. Once you start to pull the scraper over the soil, it will produce an even land surface. Compared to just leveling the soil clumps on the surface, this process or precision grading involves digging up more soil to use for leveling of the land. 1. It is ideal to grade uneven land almost immediately after a heavy downpour. This will facilitate the process, as the soil is generally softer at this time. However, if this is not possible, just water the area that needs to be leveled before starting the grading process. 2. With the use of a bulldozer, get rid of the excess dirt, weeds, and grass that remain on the area that will be leveled. The proper functioning of a water drainage system may be affected by the excess soil. Do not stop grading and removing the extra soil and dirt until the target area is completely flattened and evened out. 3. After grading the uneven portion of the land, you can use a box scraper and a garden tractor to level the surface even more. This is similar to the procedure on leveling even land discussed above. Likewise, you must get rid of the excess soil. The box scraper should be able to loosen the soil up a little more. It should be more compact once you run the bulldozer over it. 4. The newly graded area of the land must be carefully monitored especially during the rainy season. This is because unforeseen drainage issues may happen even if the land has already been graded. If this is the case, installing other drainage alternatives like post holes filled with gravel; and trenches, may be necessary. With the right tools and knowledge, grading your land can be a success. If you are unsure how to use the equipment necessary in grading land, it may be beneficial to hire a professional. This will ensure your safety and ensure that the job is done correctly the first time around.